The Partners in Prevention institute reflects a commitment to consistently utilize evidence-based strategies—on our campuses and throughout our broader communities—to reduce high-risk drinking behavior, drug use, and incidents of violence across Tennessee. This conference is for prevention specialists in any field, who are interested in advancing prevention efforts in their communities. We are now using the SCHED app for your smartphone as a resource to plan your conference experience. Download the SCHED app and search "Partners in Prevention 2019." Here you can read full presenter bios, session descriptions and plan your own conference agenda based off the sessions you wish to attend. Note: If you do not have a smartphone or wish to download the app, the material is included on our website at www.pipconference.com, or directly at https://partnersinprevention2019.sched.com/. Are there discounts available? YES! General admission attendees may use the discount code EARLYBIRD through March 31, for 15% off your regular registration. CHASCo members may contact Kayce Matthews for available discount by phone at 615-242-6400 x205 or by email at matthews@ticua.org. TDMHSAS-funded coalitions may contact Chad Johnson, TCB Director, at chad@tncertification.org, for the promotional code to claim the TDMHSAS scholarship. Do you recommend any hotels where I can stay? Trevecca Nazarene University is proud to partner with several hotels in the Nashville area. We suggest you look at these partner hotels. Please contact the hotels for exact pricing and ask for the Trevecca rate. I'm a CHASCo member (or Prospective member). Who Should I contact with questions? CHASCo members can contact Kayce Matthews with questions about CHASCo member registration and discounts, travel reimbursement, bringing multiple people from the same campus, and anything else CHASCo related. Kayce can be reached by phone at 615-242-6400 x205 or by email at matthews@ticua.org. 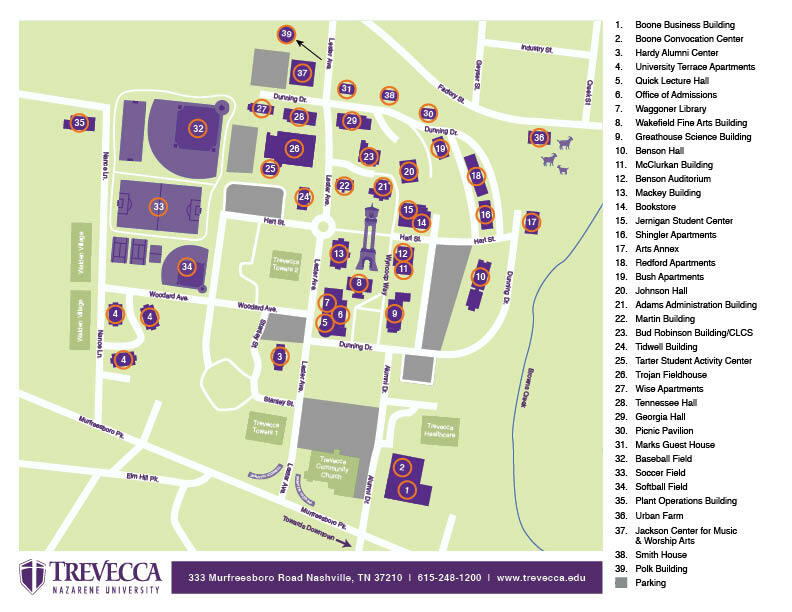 Where on Trevecca University's campus will the conference be held? The conference will begin each day in the Tarter Student Activities Center and can be located as #25 on the campus map. For campus map, click here. Afternooon concurrent sessions will be held in the nearby McClurkan building, which is #11 on the campus map. Will I get credit hours toward Certified Prevention Specialist (CPS)? Yes! Attendees can get 12 contact hours by attending the Partners in Prevention conference. Registration includes all training and materials. In addition, attendees will receive lunch both days, and coffee, drinks and light snacks throughout the conference. Can I get more information about the PiP Conference? Yes, information is available by visiting www.pipconference.com. We will consider refunds up until the day before the event. After the event has started, refunds will not be accepted. Yes. Only people registered into Eventbrite will receive a certificate. Attendees will be required to sign in at each day of the conference. Certificates will be emailed to attendees following the conference.